Practise interpersonal, problem solving and planning skills, particularly with large groups for teambuilding. In the workplace, teams have many problems to overcome which require leadership, strategy, planning, good communication, performance improvement skills and effective teamwork. Often with the added pressure of a critical time constraint! Team Shapes is a challenging training game which combines all these challenges into one fun activity. If you have used Colourshapes and Colourblind training activities you will find Team Shapes an ideal follow-up training game. 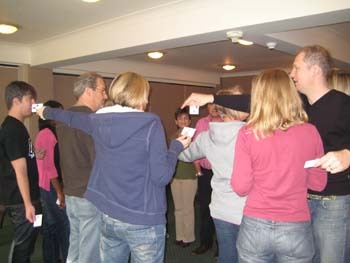 Each person is given one or more cards (depending on the number of participants) and by effective communication, identify how their cards can be linked with others to form a pattern. 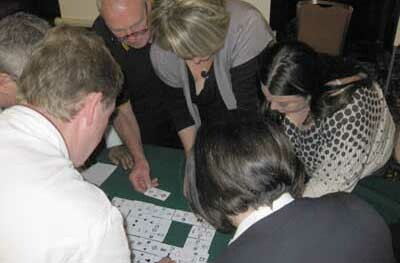 They have a time limit to plan the task; then 30 seconds for all the team to place the cards into the pattern. It is also essential that the team clearly define the challenge, agree a strategy and work out a plan to overcome it. However, the limited time is ticking away, adding pressure to the task. Everyone must get involved or vital clues will be lost. Someone has to take control or over talking occurs and more vital clues are lost. Time constraints create an exciting climax to the activity. Will their planning and practice bring success in the final run? Not language specific – participants speak in their own language or use it to help their learning of a new language. Assessing performance of potential staff at an assessment centre. Buy the Team Shapes training game for Four to Twenty People. Price: £200 + delivery & VAT (if applicable). Select Add to Cart (below) to buy Team Shapes for Ten to Thirty People. Price: £230 + delivery & VAT (if applicable). Select Add to Cart (below) to buy Team Shapes for Twenty to Sixty People. Price: £260 + delivery & VAT (if applicable). Select Add to Cart (below) to buy the Team Shapes for Ten to Thirty People. Price: £230 + delivery & VAT (if applicable). Select Add to Cart (below) to buy the Team Shapes for Twenty to Sixty People. Price: £260 + delivery and VAT (if applicable). "Really impactful - over fifty of us solved this problem together! Understanding our different views will be valuable returning to our different offices - thanks for the debrief."